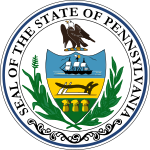 The 1992 United States Senate election in Pennsylvania was held on November 3, 1992. Incumbent Republican U.S. Senator Arlen Specter won re-election to a third term. Despite his powerful position in the Senate, Specter had numerous problems entering the election. A moderate who generally received only tepid support from his party's conservative wing, he was criticized by the right for opposing Ronald Reagan's nomination of Robert Bork to the Supreme Court. Specter subsequently faced a primary challenge from an ultra-conservative State Representative named Stephen Freind; although the incumbent won handily, the battle was expensive and featured many damaging attack ads. The senator was also highly targeted by women's groups for his involvement in the Clarence Thomas proceedings; in his questioning of Anita Hill, Specter appeared to show no sympathy for her allegations of sexual harassment. Furthermore, President Bush's popularity was rapidly declining in the state over high unemployment rates, and was subsequently dragging down Republican candidates. Yeakel won the five-way primary with 45% of the vote, easily defeating the endorsed candidate, Lieutenant Governor Mark Singel, in an election cycle dubbed by pundits as the "year of the woman". Polls put her ahead of Specter by double digits. But Specter ran a campaign that was praised by political analysts for being almost flawless. Despite Yeakel's personal wealth, her inexperience in politics led to fundraising problems; Specter outspent her by a two-to-one margin. This kept Yeakel from running television ads until September 23, a month and a half before the election. The moderate Specter portrayed Yeakel, despite her liberal attitude, as a member of an elitist blue-blood family. He emphasized her father's votes against the Civil Rights Act of 1964 while in Congress, her affiliation with an all-white country club, and her church's minister's vocal criticism of the Israeli government. It did not help matters that a newspaper strike in Pittsburgh crippled Yeakel's ability to introduce herself to voters in the southwest. Despite her mistakes, including a frequent tendency to mispronounce the names of places in which she was campaigning, Yeakel continued to perform solidly. On Election Day she captured by large numbers the traditional Democratic strongholds of the state, such as Pittsburgh, Scranton, and Erie. However, Specter undercut Yeakel's support in the state's most critical Democratic county: Philadelphia. Specter campaigned hard in black neighborhoods, and received the endorsement of the NAACP. Furthermore, he capitalized on the ambivalence of many Philadelphia Democratic leaders to Yeakel. A self-described reform candidate, Yeakel distanced herself from the city's ward leaders. As a result, while Yeakel carried Philadelphia by a solid 122,000-vote margin, she significantly underperformed Bill Clinton's total there. Also critical to the campaign was Specter's grass-roots involvement in Yeakel's base, the traditionally GOP, but Democratic-trending, suburbs of Philadelphia. Yeakel also significantly underperformed in the northeast and southwest. She barely won Lackawanna County, home to Scranton, and barely lost Allegheny County, home to Pittsburgh; as mentioned above, she easily carried the cities themselves. ^ "Yeakel to oppose Specter, main target in Senate race". Pittsburgh Post-Gazette. April 29, 1992. Retrieved August 20, 2010. ^ "Yeakel, Lynn". OurCampaigns. Retrieved August 20, 2010. ^ a b c d e Kennedy, John J. (2006). Pennsylvania Elections: Statewide Contests from 1950-2004. United Press of America. ISBN 9780761832799. ^ Kornacki, Steve (April 30, 2009). "Lynn Yeakel Isn't Angry Anymore". New York Observer. Retrieved August 20, 2010.